The great guest post was written by Stephanie Ann Newton! I encourage you to go check out her website! If you are anything like me, your to-do list is longer than your endurance! Maybe you pump yourself full of coffee to keep you going, but deep down you know that this temporary fix can only patch things up for so long. Once “burn-out” sets in, it’s difficult to escape! So What is Really Going On With Burnout and How Can We Fix It? Amongst some medical professionals, burnout is synonymous with chronic fatigue. And while chronic fatigue can have several causes, experts believe that in many cases it is due to adrenal fatigue. The burnout of our adrenal glands! I’m going to share a little “formula” for success to help prevent adrenal fatigue or support the adrenals and the immune system when they are lagging. But first, let’s discuss what it is and what the symptoms are. The existence of adrenal fatigue is debated within the mainstream medical community. Some say it doesn’t exist. Some say it is a milder, less severe form of Addison’s Disease (a serious, sometimes life-threatening dysfunction of the adrenal glands). However, research does back up the existence of some level of adrenal involvement in CFS, or Chronic Fatigue Syndrome. According to a study published in the Journal of Pediatric Endocrinology and Metabolism, chronic fatigue syndrome has been linked to lower than normal cortisol levels (indicating a reduction in the adrenal gland’s ability to maintain cortisol levels). Adrenal fatigue has many causes, such as insufficient sleep, chronic emotional and mental stress, and too much caffeine. In turn, our adrenal glands try to keep up by manufacturing more hormones such as cortisol and adrenaline but eventually burn out from the increased demands placed on them. Gradually the adrenal glands become seriously exhausted, with the first and most profound effect being their waning ability to produce DHEA. As levels of this restorative hormone, fall, cortisol and adrenaline levels begin to fluctuate as well, as the adrenal glands attempt to fill increasingly impossible orders for more support. The conundrum with adrenal fatigue is that the very factors which cause it, are also the factors exacerbated, or worsened, by it. So it tends to be a vicious cycle. For example, one of the causes of adrenal fatigue is a chronic lack of sleep. And one of the best ways to treat adrenal fatigue is to get more sleep. However, one of the symptoms of adrenal fatigue is an inability to sleep! Another example is stress. One of the causes of adrenal fatigue is chronic stress. And one of the symptoms of adrenal fatigue is the inability to withstand stress! As in…”I have a short fuse”. Or, “my nerves are shot!”. And what about caffeine? Caffeine is a contributor to adrenal fatigue! Yet that warm, energizing Cup O’ Joe is one of the first things people reach for to withstand all that they have on their plates with little energy to accomplish it all! So How Do We Break This Vicious Cycle? Remember that old saying “an ounce of prevention is worth a pound of cure”? Never is that more accurate than when referring to the health of our adrenal glands! Make a paradigm shift in your mind now. Change your lifestyle before it changes you! Are there emotional situations or relationships which can be altered? Could your exercise and eating habits be improved? But what if it’s too late and you’re already burned out? Fortunately, there is a lot that can be done to break the cycle and get your adrenal glands performing optimally again. One such “remedy” which can help support adrenal function is a drink which combines Himalayan salt and vitamin C.
How Does Salt Improve Adrenal Function? In some cases of adrenal insufficiency, sodium and potassium levels can be out of balance, causing a salt deficiency and salt cravings. This can occur due to low aldosterone levels, a hormone manufactured by the adrenal glands. Another consequence of low aldosterone is electrolyte imbalance and cell dehydration, which both have negative effects on almost all physiological reactions in the body. Aside from salt cravings, low blood pressure and light-headedness, patients with adrenal fatigue often experience an irregular heartbeat, lethargy, muscle weakness, and increased thirst. These are all a result of an imbalance in sodium and other minerals, including potassium and magnesium. Increasing your salt intake is one way to help restore these imbalances. And the benefit of using Himalayan salt, as opposed to some other salts, is that in addition to sodium it contains 87 trace minerals that our bodies crave for all sorts of biochemical processes! The Adrenal Gland: That is among the organs with the highest concentration of vitamin C in the body. Interestingly, both the adrenal cortex and the medulla accumulate such high levels of ascorbate. Ascorbic acid is a cofactor required both in catecholamine biosynthesis and in adrenal steroidogenesis. Vitamin C: This vitamin is known to be used up by the body faster under stressful conditions, when using tobacco and during infections. By supplying the adrenal glands and our immune systems with more vitamin C, we are enhancing the ability of these systems to do their jobs more effectively! Interestingly, some people within the Lyme Disease community use what is called the Salt-C Protocol. In Lyme Disease it is important to strengthen the immune system, and there are many anecdotal stories from within this community which claim that it really works! So let’s get started and see how it works for us! In my own experience, drinking Himalayan salt provides an immediately energy boost which seems to last throughout the day. However, it can be very detoxing at first, so consider cutting the following recipe in half for the first few days. And vitamin C can be taken at a dosage up to “bowel tolerance” (the amount that causes you to have softer or more frequent bowel movements), as it is a water-soluble vitamin and cannot become build-up in the body. I generally take 500-1000 mg per day, although some practitioners advocate for much more. Whole food-based vitamin C powder (such as acerola powder) or a synthetic vitamin c powder, preferably with bioflavonoids. *Sole has 478mg of sodium, which is 20% of the USDA’s recommended daily allowance of sodium (2500mg). 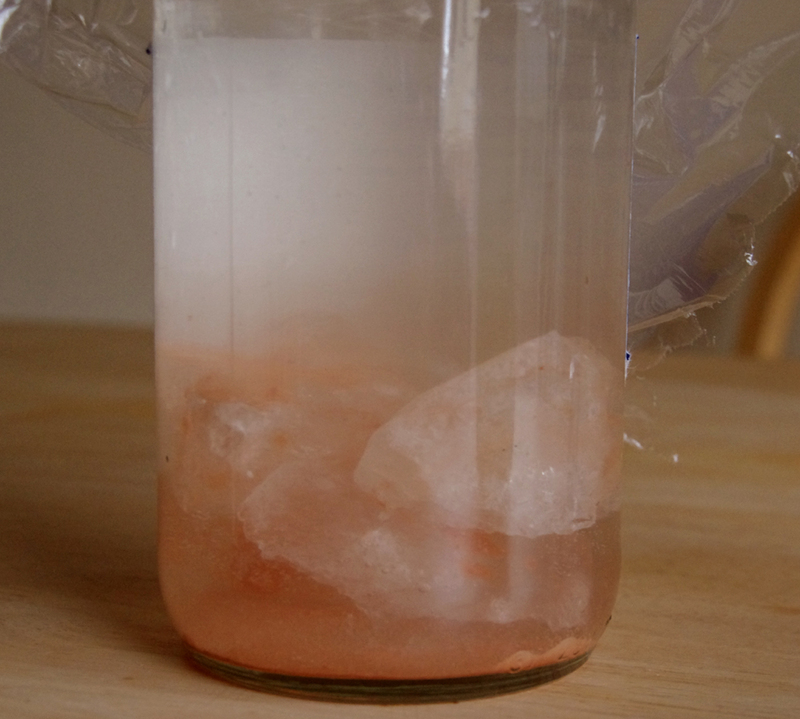 To prepare the sole solution, place several chunks of Himalayan salt into a glass mason jar and fill with water until the water level is a couple of inches above the salt chunks. Cover with a non-metal lid (I use plastic wrap) and let sit for a day or two, allowing the water to become saturated with the salt. There should be chunks of salt left. If not, the solution is not fully saturated…add more chunks and let sit another day. This solution can sit on your counter indefinitely, adding more chunks and water as needed. When it comes time to make your salt and vitamin c solution, use one teaspoon of the sole solution to 8 ounces of water and then add the vitamin C. Proponents of the benefits of Himalayan salt say that you should not stir the solution with a metal spoon as it will affect the energetic nature of the salt, so consider stirring with a plastic spoon.